Directions: Elevation is 6,800' at Sonora Bridge. 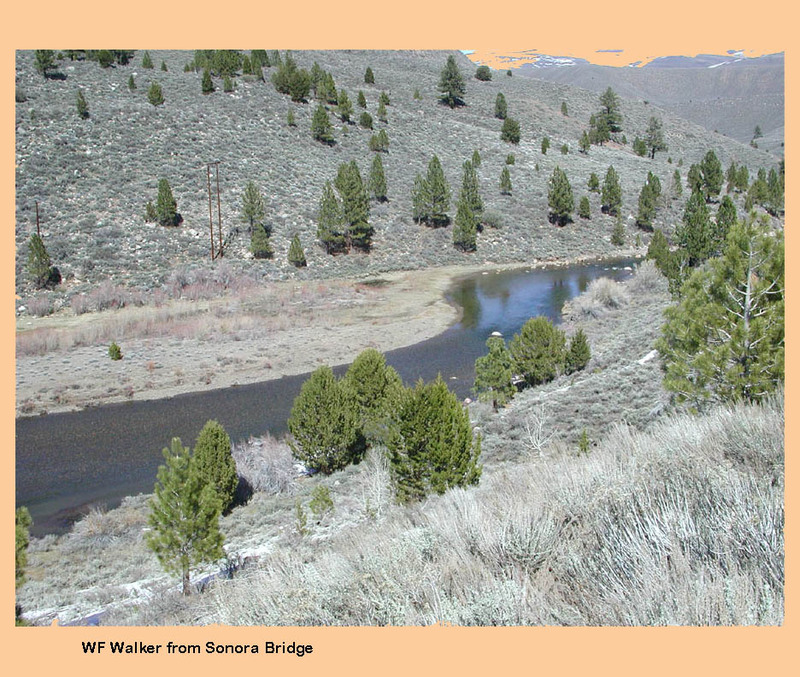 From Sonora Bridge at Hwy 108 to Hwy 395, fishable for 2 miles. Otherwise accessed from the highways taking care not to trespass. Pickle Meadow is reached by going 4 miles on Hwy 108 from the Hwy 395 turnoff. Turn left and go one mile further to the meadow. A parking area is available with a trail to the river. 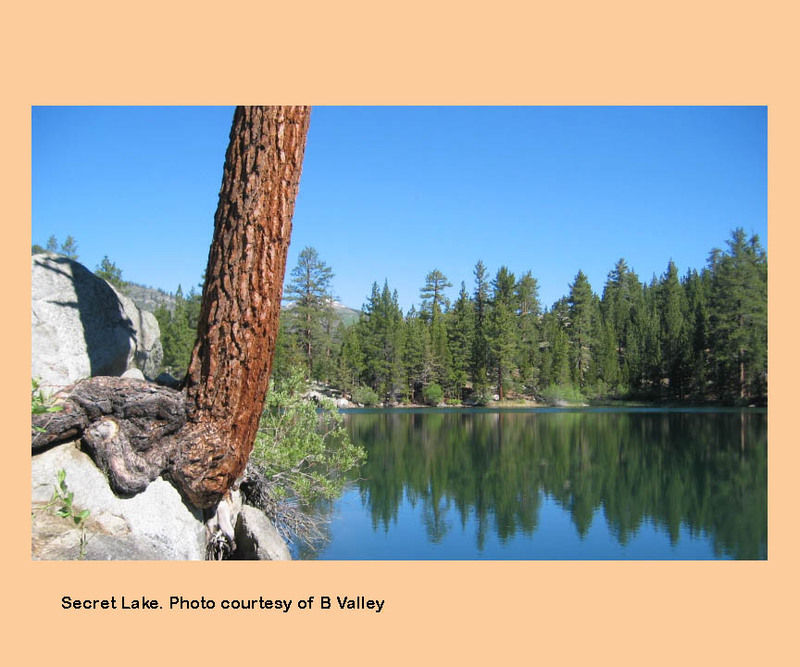 Kirman Lake is accessed by a 3 mile trail from Hwy 108. An orange ladder on Hwy 108, about 1/2 mile from Hwy 395 junction, marks the access point. 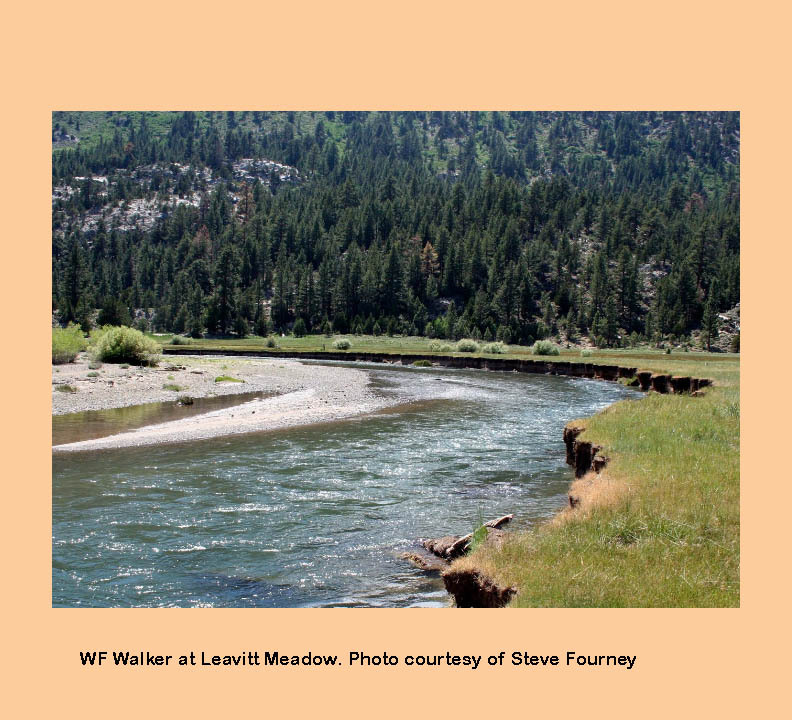 The West Walker River is relatively small and resembles a stream in many places. 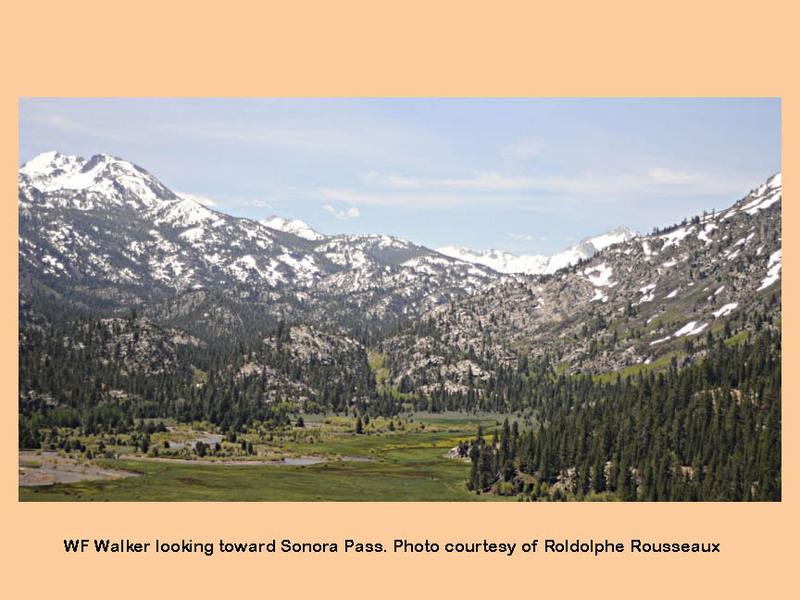 It's headwaters lie in the mountains south of Sonora Pass, on the eastern crest. The water flows down to Leavitt Meadows at Highway 108. This area has lots of riffles with large boulders and pools. Pickle Meadows is in this area containing Brooks, Rainbows, Browns, and Mountain Whitefish. It is a classic freestone stream with easy wading. The fish tend to be small averaging about 8". An attractor dry such as a Royal Wulff with a PT nymph or Hare's Ear dropper is an effective rig. Midge larva patterns also work well in the deeper pools. The West Walker turns northward through a canyon at the juction of Hwy 108 and 395. It flows along Hwy 395 through this canyon. The West Walker usually clears by late June where fishing is productive using large weighted nymphs. Also effective are muddler minnows size 8-12 on a sink tip. Fishing is best when flows reach 150 cfs or less. Dry Fly fishing is usually during the last 2 hours of light, using an Elk Hair Caddis in tan, green, or brown. Another good pattern is the Royal Trude to imitate caddis. A Hopper with a dropper (BH Nymph) rig is a good mid-summer choice. The season is the last Saturday of April to Nov. 15th. 5 fish limit and 10 in possession in most areas. Special regulations apply to Kirman Lake, Lane Lake, and Roosevelt Lake. 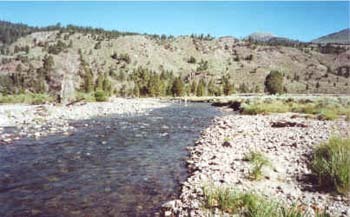 The Little Walker River is a smaller version of the West Walker. It consists of Rainbows, Brookies, and Browns of generally a smaller size than found on the West Walker. The stream is a freestone type with some deep pools. It gets less fishing pressure than the West Walker. 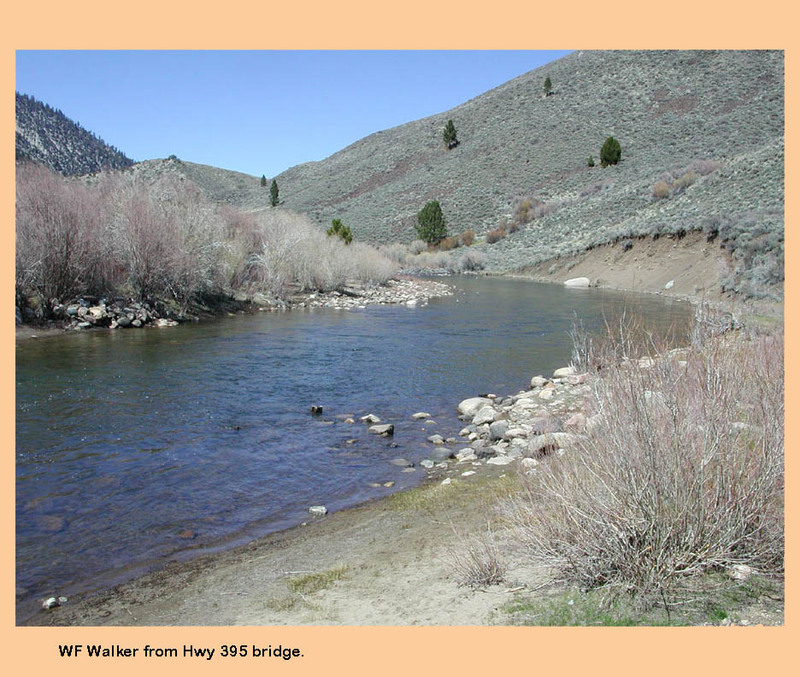 Wolf Creek and Silver Creek are closed to fishing as the Walker-strain of Lahontan Cutthroat are re-introduced to these streams. These streams may be opened to fishing once the population can sustain angling pressure. Kirman Lake (45 acres) at 7,200' containing Brookies and Lahonton Cutthroats. 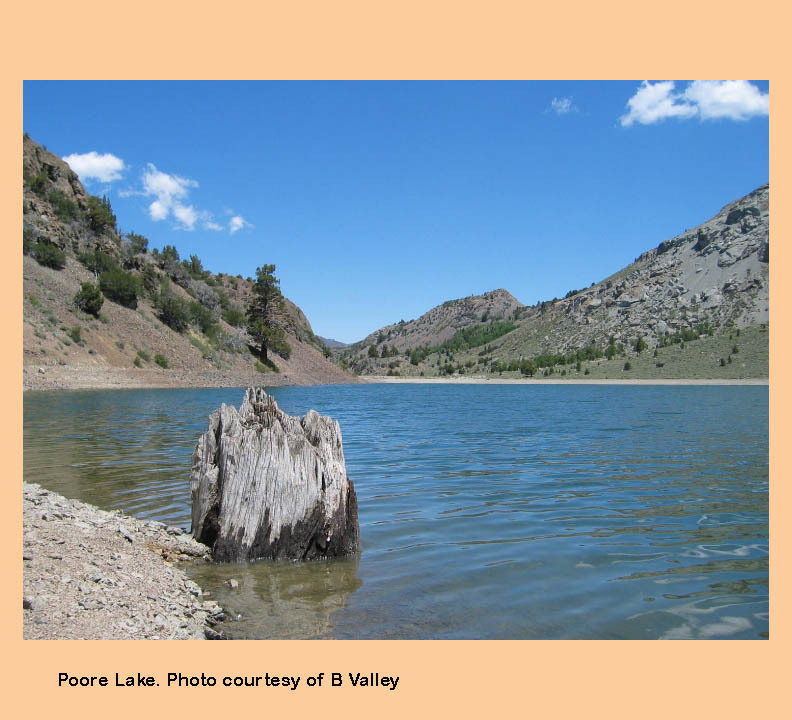 Kirman Lake was named after Richard Kirman, a wealthy banker out of Reno who owned much of the land within this area during the late 1800's. Most of the Brookies are in the 14-16" range with some monsters up to eight pounds. The Cutthroats are usually within the deeper portions of the lake. Kirman is a trophy trout lake with special regulations of barbless flies or lures only, 16" minimum, and 2 trout limit. The tributaries of Kirman are off limits for fishing. The shoreline is thick with weedbeds and reeds , so it is best float tubed. You have to hike into Kirman, a 3 mile walk from the Sonora Campground Trailhead. It is a fairly flat dirt road that winds up into the foothills. From there, it gets steep and then drops into a small valley that holds the lake. Good patterns for Kirman are: Green Scuds 10-16, Olive Leeches 10-12, Zug Bugs 14-18, BH Prince Nymphs 14-18, Palomino Midges 14-18 and BH Hare's Ear 12-16. The large size of the fish in Kirman is due to the immense population of Gammarus scuds that reside in the lake. The fish feed through thick concentrations of these scuds and gorge themselves into girthy football-sized fish. Try Scud patterns in orange, green and olive colors. Across from the Marine Corps Training Center on Hwy 108 is the trailhead through Leavitt Meadow to a number of fine lakes. These lakes are about a two hour hike from the trailhead. Poore Lake (77 acres) at 7,214' is a trophy Brookie Lake similar to Kirman with fish up to 5 lbs. 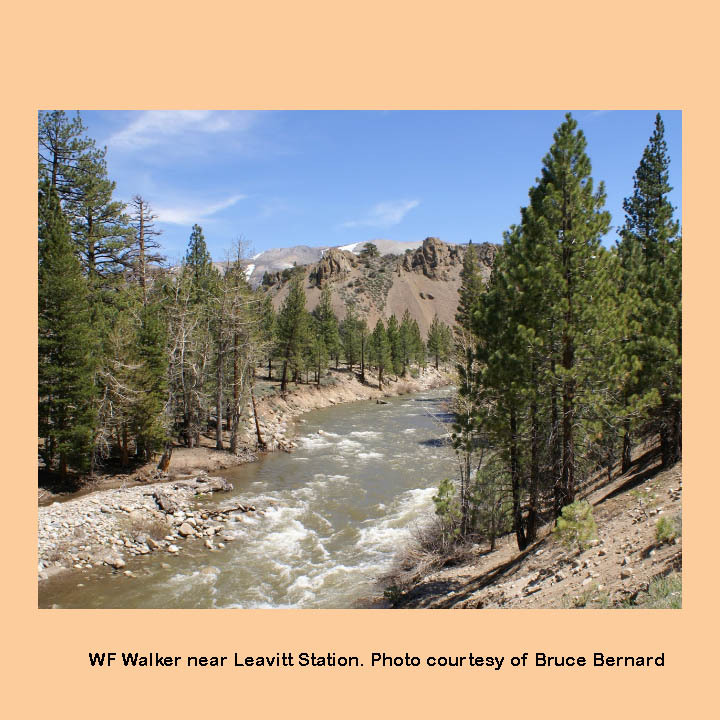 It is about a 3 mile hike from the Leavitt Trailhead. Take the trail east fork just south of Secret Lake. At Poore, use Mohair Leech patterns and Marabou Muddlers which have red and gold coloration to the flies. The Brookies tend to feed on Lahonton Redside suckers in the early and late parts of the days within the shallows. These streamer patterns do an excellent job representing the baitfish. The lake is relatively shallow in the upper reaches and deepens towards the dam to about 85 feet. During midday and throughout the summer, fishing the lower third of the reservoir is generally better. Poore also has a number of hatches that come off, particularly along the eastern shoreline during the evening hours. Try Caddis imitations, Callibaetis and Adams in size 14-16. Roosevelt Lake and Lane Lake (8 acres each) sit at about 7,300'. These two lakes are connected by a narrow creek. They are about 3.2 miles from the trailhead. Roosevelt is particularly good at both the inlet and the outlet. They are part of the Catch & Release program with the State of California with a 2 trout limit. Lane has a rocky shoreline but fishes well along the western side where a channel extends to about a 30' depth. Each lake contains Brookies in the 10-12" range as well as Lahonton Cutthroats. Since the lakes are at relatively low elevations, the best time for fishing is early and late season. There are good dry fly opportunites at the inlets and outlets, particularly during the evenings. Secret Lake (7 acres) is difficult to fish without a float tube as the shoreline contains dense weedbeds. About 2 miles from trailhead. The lake contains Rainbows in the 13-16" range.